I live in Virginian and have for most of my life. Even before I entered 4th grade in the fall of 1968, Virginia’s 4th grade students were learning about the first permanent European settlement on North America. It seemed a matter of State pride to do so. 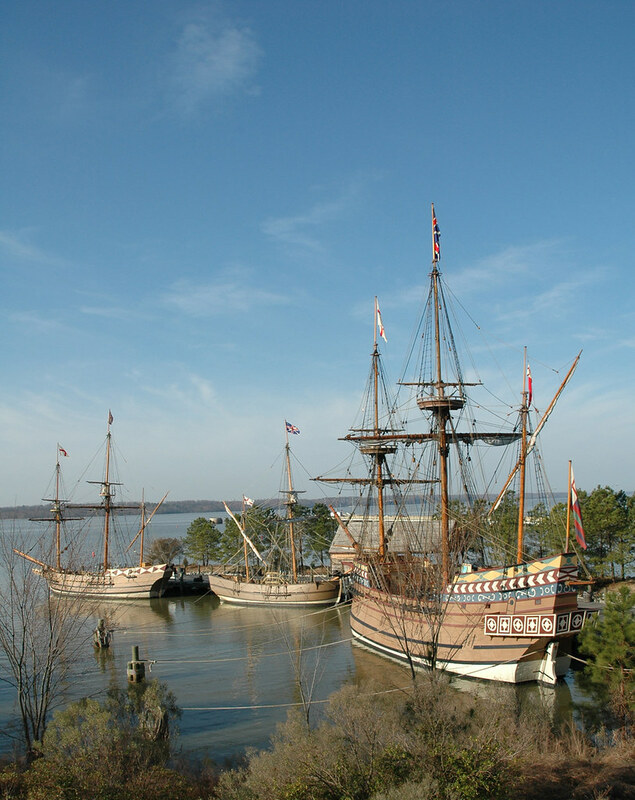 The lessons generally focused more on Jamestown than the journey to it , and in the intervening years since I was first introduced to this historical event, much more has been discovered at the actual site of Jamestown. The archaeological stories which have come from years of study are both rich and intriguing. Some things have been added to the narrative since I was in fourth grade. Christopher Newport was the captain of the expedition. For some reason his name wasn’t mentioned back in the day, but now he’s listed as a first class explorer with Jacques Cartier, Juan Ponce De Leon and, of course, Christopher Columbus. Captain Newport even has a University named after him. As a technology resource teacher, I have been asked about a zillion times to come up with materials about the aforementioned explorers as they are part of our State’s history curriculum in grade 3, wherein our students learn about the exploration and geography of the exploration of the Americas. When Google’s map products became available, I naturally started to think of ways students could use these tools for this particular topic. Its a perfect fit. It even works better for the more extensive investigation in the Virginia Studies Unit in grade four. My first idea was to have the students plot the journey from England to Jamestown. Then I quickly realized that I knew nothing about this other than they started in England and ended up at a place they ended up calling Jamestown. I needed to find out more about this and after about 20 seconds of searching with Google, came up with a guy named George Percy. Percy was one of the original settlers of Jamestown and actually managed to survive. (Mostly because he didn’t stay.) Luckily, he was an educated man who liked to keep a journal and it is this primary document which details the trip from London to Jamestown with descriptions of many events along the way. Most importantly , he was good about writing down both places and dates. Nothing beats having a primary document as a source of valid information. The problem with this particular primary document is that it is written in the language of the time. My students are still developing their comprehension skills with modern language, and asking them to interpret an archaic form of English would be tough. So, to expedite the project, I decided to pull out the important places and dates and chunk them into a more reasonably interpreted format. As you can see, its simply a three column document with the place marker number, the content for it, and the location it will go on the map. Given a succinct summary of dates and places described in George Percy’s travel journal to Jamestown, the learner will create a map on which connected place markers show the path of the journey and the dates at which each location was visited. The next issue is exactly what tool I wanted to use. We are GAFE school and I could choose between Google Earth, Google Maps and my new favorite, Google Tour Builder. Tour Builder is my primary choice because of its ease of use and because it integrates so well with our Google domain for students. It automatically saves their work, requires less technical training to use and is accessible on their Chromebooks. It also allows the student to share their work with their teacher. Since Google Tour Builder is so easy to use, the students can actually learn to use it at the same time they start this project. It’s fun to watch. Our 4th graders have nearly zero experience in using maps. They’ve have some experience with “components” of a map, but this doesn’t mean much in to context of using it for directions or to locate points on earth. If you’ve looked at the summary of dates and location from George Percy’s journal, you might recall that their trip originated on the docks in London, England. That’s the first puzzling thing for students, as they have no earthly idea where England is. If they then scroll down the page of the document, you’ll see nice image captures I’ve include to help students place the locations detailed in the narrative. Its seems like cheating, but if this is the first mapping activity that uses a globe, students have very little context to connect their prior knowledge to the tasks they are being asked to do. Getting the 12 place markers accurately on the map is the first goal and the search feature of Google Tour Builder is both a help and a hindrance. For an island, say Martinique, it provides a quick way for students to find a specific location on the journey. For a more abstract term, like “Tropic of Cancer” there’s an infinite of possibilities returned in the search and I know from experience that students will place the on the map even if they don’t make a lick of sense. My admonition is to “look at the map and make sure you place marker makes sense, that is it is in the right part of the world and looks like it is going in the direction that would allow the travelers to complete their journey”. I tell’m this and still get some interesting maps which make no sense at all. To be sure, this kind of project with 4th graders is a process. Their knowledge of geography in general and the technology of maps is not well developed. Nor is their ability to write easily. Still, it’s a project that requires many skills and introduces technologies that will be important to their lives. Previous Previous post: Getting Started with Google Earth in Your Classroom?